Half way down a winding country road in New York’s wealthy Westchester County, one of America’s most famous revolutionaries lies buried under three feet of crisp white snow. It is 50 years since Malcolm X was gunned down at the Audubon Ballroom in Washington Heights, Manhattan, and since then he has lain in Ferncliff Cemetery – far from his people, surrounded by a ring of country clubs and golf clubs, alongside other dead celebrities including Judy Garland, Joan Crawford and Ed Sullivan. He is an icon. He is a face on a T-shirt. But although he was certainly not silent in life, his daughter Ilyasah Shabazz fears he is not well understood. “It was when I was watching the second Obama inauguration that I started to really worry that my father was being written out of history,” she says, explaining her determination to correct what, she believes, is the misrepresentation of her father’s legacy with a series of projects that include turning the memorial centre for both of her parents at the Audubon Ballroom into a more active institution, commemorating the afternoon of Malcolm X’s murder with a moment of silence, and supporting a campaign for his birthday to become a national holiday in the US, as is Martin Luther King’s. On a quiet winter’s morning at the Audubon Ballroom, with its small exhibit and sole staff member on the premises, some of these plans seem far from fruition – but Malcolm X continues to be a powerful figure in the political consciousness and a widely accepted part of the American story. In 1972, Malcolm’s widow, Betty Shabazz, dined with Richard Nixon, and in 1999 the US Postal Service issued a Malcolm X stamp in his honour – something the man himself might have found unbelievable. Even so, it may be more difficult for President Obama – who has rejected the false claim that he is a Muslim – to recognise Malcolm X, than Clinton or Nixon. Although Obama has talked about The Autobiography of Malcolm X inspiring him as a young man, it was a bust of Martin Luther King that he installed in the Oval Office. If it is easier for the political establishment to embrace Martin Luther King’s doctrine than to look into the mirror of the consequences of racial oppression and justice held up to the world by Malcolm X, the political reality annoys Ilyasah: “Why can’t these people just have a backbone and invite Malcolm? I mean, what is the big deal? Put a bust up of Malcolm X. Let’s tell the truth about Malcolm X,” she says. What she remembers most about her father is love; something she knows not often associated with his public representation as an angry militant separatist. 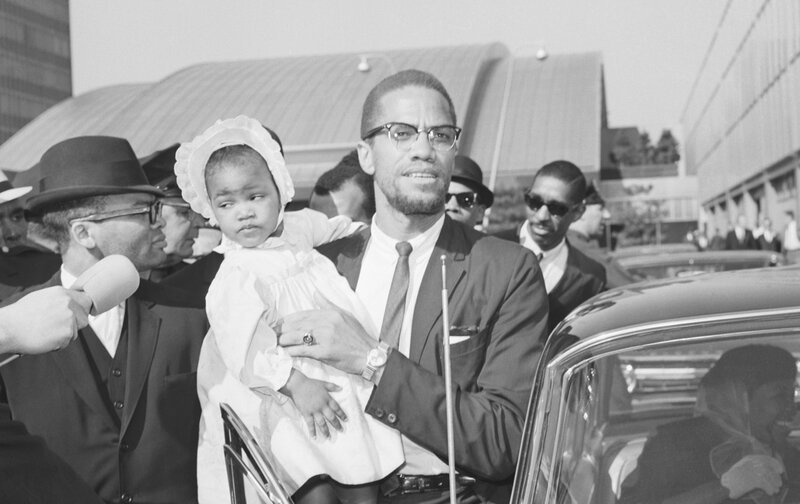 While Malcolm, also known as El-Hajj Malik El-Shabazz, advocated discipline, self reliance and pride in the black community and his African roots, he never supported violence, she says – only telling his followers that they were entitled to defend themselves in the face of the horrific assaults and murders that black people faced on a daily basis. After he left the Nation of Islam in 1964, he embraced Sunni Islam and evolved his stance on topics as wide ranging as women’s rights, interracial marriage, and the possibility of people of all races and colours working together against injustice in a common brotherhood. At the time of his death he was no longer Malcolm X, preaching to black urban ghettos, but Malcolm the global revolutionary, who had brought together an alliance of African and Middle Eastern leaders in support of his new Organization of Afro-American Unity, and who was intent on pressing his human rights claims against the US government at the United Nations. It was an evolution lost on most of mainstream America, however, who remembered the man who once said, “The common enemy is the white man,” reminded black Americans that it was within their legal rights to buy a shotgun, and said president Kennedy’s assassination was a case of “chickens coming home to roost”. After his murder, The New York Times called him an “extraordinary and twisted man” who had turned his gifts to “evil purpose”, while TIME denounced him a demagogue whose “creed was violence”. “College was where I got to actually experience the difference between black and white,” she says. She was daunted when the Black Student Union appointed her their chairperson before she had even arrived. “What was I supposed to say?” she laughs, and makes a tiny black-power fist pump with a bewildered face: “Power to the people? Say no to drugs?” Public speaking terrified her and she once fled from the stage pretending to be sick. Her sister calmed her by telling her that she was the daughter of the Malcolm X, and she didn’t need to prove it to anybody. “Everyone wants me to be this political person . . . I’m not Malcolm X.” Instead she likes teaching young people, and exploring her father’s legacy through her books. After writing her autobiography, she wrote a children’s book, Malcolm Little: The Boy Who Grew Up to Become Malcolm X, and the recently released X: A Novel. Malcolm X’s widow died after being burned in a fire in their apartment set by her grandson, and Ilyasah Shabazz’s 12 year old nephew, Malcolm. His mother, Qubilah had been arrested two years earlier for an alleged plot to kill Louis Farrakhan, by then the leader of the Nation of Islam, who she believed was responsible for death of her father. Although Qubilah maintains her innocence, she accepted a plea bargain that involved drug and alcohol counselling, and her son Malcolm was living with his grandmother. He later said setting the fire was attempt to be reunited with his mother. Malcolm X had been pained by the death of his father and the dismantling of his own family. “No one was there to say – young man, it’s okay, we’re going to get through this,” says Ilyasah, who believes her father’s own bestselling book, The Autobiography of Malcolm X downplays his solid supportive family background, and plays up his troubled youth. Young Malcolm was finding his own way as an activist when he was killed in 2013 after a dispute in a bar in Mexico, where he had gone to support the rights of Mexican construction workers in the US. Now he lies in Ferncliff Cemetery alongside his grandparents. Last summer’s protests over the shooting of Michael Brown in Ferguson, Missouri, and then over the death of Eric Garner in New York, made Ilyasah want to reach out again to young Americans and explain her father’s legacy. The end result for the memory of Malcolm X may not yet be a national holiday. Howard Dodson, who oversaw the Malcolm X papers at the Schomburg Center for Research in Black Culture, recounts that only intense lobbying by his family, and well-known figures, achieved that objective for Martin Luther King in the face of much opposition. Such opposition would be only more intense over Malcolm X. More recently, Ilyasah and her family have disputed a series of lurid personal claims in a 2011 biography of Malcolm X written by Manning Marable. “It was a great book but they inserted three things that were just absolutely ridiculous, and we felt that it was sensationalised,” she says. 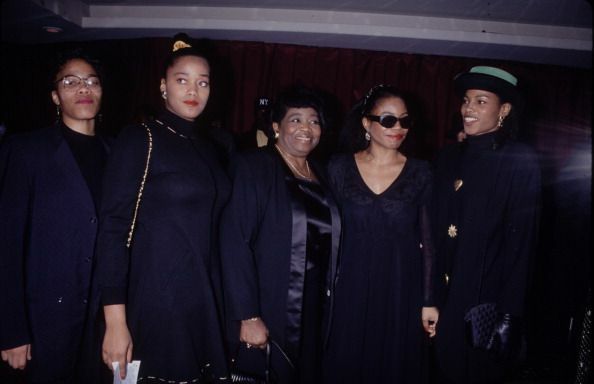 In addition to alleging that Malcolm X was a cross-dresser, “they said that my father liked putting powder on old white men’s butts”, and alluded to a relationship Betty Shabazz may have had with another man while married to Malcolm. These things are “just not true”, Ilyasah says, adding that her mother was a widow for many years and never remarried. If anything of these allegations had been true, she points out, the FBI would have had a field day revealing them in the 1960s.